On October 26, 1992, two referendums, the Quebec government’s referendum in Quebec, and the federal government’s referendum in all other provinces and territories, were put to the voters. 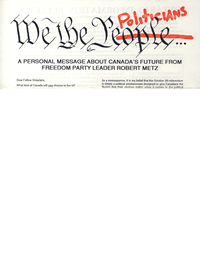 The referendum asked: “Do you agree that the Constitution of Canada should be renewed on the basis of the agreement reached on August 28, 1992?”. Fifty four point three percent (54.3%) of those who voted voted “No”. Document Published: estimated early October, 1992.